If you are a man who is considering one of the scalp micropigmentation multi session application methods, it is time you rethink these types of applications. What the above “authority” does not understand or even admit to acknowledging, is that Weston developed specific equipment and a method that works and is now a registered patent. 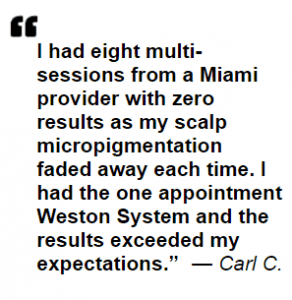 Weston is a “major provider” and was even the first scalp micropigmentation provider in the USA. Weston has been performing his one-time, permanent scalp pigmentations since 2009 successfully. Only someone like Weston with 40 years experience and his contributions to the scalp micropigmentation field could have researched and developed a patent for a needle and method. Weston does not care about “making a killing,” but only to offer the best scalp pigmentation available and the most cost-effective for clients. Weston’s proven track record since 2009 speaks for itself. The SMP-MS companies also claim that multi-sessions need to be done as to keep check on “pigment retention.” This merely is elaborate terminology for “pigment fading.” They have to wait a week or two in between sessions to see how much pigment has in fact faded to reapply additional sessions. In cases of on-going skin conditions, the client is not even a candidate. Excessively dry skin or dandruff must be dealt prior in order for any scalp micropigmentation treatment to proceed. The extent of any client’s hair transplant scars must be properly assessed for the technician’s capabilities. Providers must learn to say “no” for the benefit of the client and refrain from seeking to pad their own bottom line at the client’s expense. Clients should not have to pay for additional “sessions” because their scalp was not properly assessed in the first place. Example of a five multi-session pigmentation that faded after 6 months. The new pigmentation to the left is that of The Weston System being applied as a correction. Keep these costs in mind when researching pricing. Depending on the provider, there is an initial quote, then any needed sessions past the first two or three are charged on an average of $500 to $800 per additional per session. If the technician is inexperienced and you are required to have additional sessions, the cost per additional session falls on you. This may very well be an unanticipated cost until you proceed through your “sessions.” Returning for numerous sessions multiple times for completion drives up the cost of the application, bearing travel and lodging expenses each time or time off work. In addition, until your final “treatment” is completed 4 to 6 weeks later, you are temporarily left with an unfinished scalp pigmentation. If you are on a budget, multi-sessions can be an enticement, as they permit you to pay for each “session” separately so you would have 4 to 6 weeks to pay for your application. However, if you don’t have the budget, you are forever left with an unfinished scalp pigmentation. We have seen dozens of half-completed multi-session procedures. Some companies entice you with a low introductory cost of $399.00 but require you to have 9 sessions. The end cost? $3591 and you have to return 9 times. So how is this really a savings with time off work, travel and other added expenses. In addition, multi-session methods (SMP-MS) will eventually cause scarring. 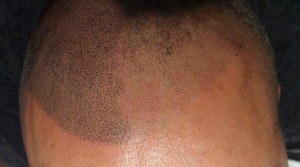 See Scalp Micropigmentation Multi-Sessions Scarring. The time frame for each appointment for the multi-session procedures are only a few hours each (averaging about 3 hours each) and require that your application be done in three to five sessions over a period of many weeks, even as many as nine reported. This also permits providers to steadily keep a large volume of customers by scheduling several men per day. Each Weston Center artists gives their full attention to completing one client at a time, not working on several men during any one day. Working on more than one man per day in a procedure room also opens up sterilization issues. Every time a scalp is tattooed, a tint of color remains that does not entirely diminish. This then becomes compounded with each application. There is also another major concern with constant reapplications. Each application of the needle is scarring the scalp and when you keep scarring the skin, soon it will not retain the pigment at all, or remain in patches. Even after their scalp pigmentation, many men wish to continue use of Minoxidil. However, the temporary pigments that are mostly used for SMP-MS are affected by alcohol in Minoxidil and will contribute further to pre-mature fading. The aftercare for these “session” treatments require you to not wash your scalp for a minimum of three days after each session. Apparently, a sink bath is all you can do for these first three days. Not very hygienic, but then you are permitted to wash with water only on the fourth day (no soap or shampoo). And remember, this routine is for at least three separate sessions for many weeks. You are permitted only to take a “real shower” a week after each session. You’re safe now so you don’t wash out the pigment that was barely placed in the scalp. In addition to little pigment retention from the inappropriate needle, these pigments are manufactured to intentionally fade and this is also why the multi-session pigments need to be reapplied after several years. And remember, this must be repeated after each session. If you are required to have more sessions, again no water, showering or shampooing. So within a month’s time with three sessions, you have gone without a ‘real” shower for almost three weeks. But think about the cost of the shampoo and water you have saved. Do these “replicated” follicles really resemble real hair follicles? Since a blanket of points is placed at each session, eventually multi-sessions can result in nearly a solid fill. Points can be placed on top of each other or too close together, also ending in a solid fill or fully shaded look. (See featured photo). Multi-sessions cannot produce an individual pointillism application with natural scalp skin showing through like a normal, healthy scalp. (See top left insert). 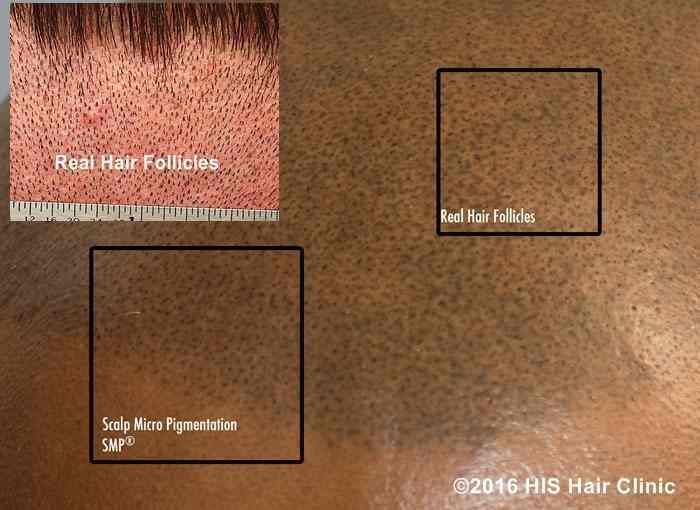 Compare what this photo is claiming as “real” follicles to the claim of the multi-session replicated follicles. The “real” follicles as well as the alleged replicated ones look nothing like the real follicle insert. Multi-session companies also claim that numerous sessions are required in order to achieve a “3-D” look. The Weston System reproduces follicles that resemble actual hair. Now compare the look of the one-session only Weston System. The replicated follicles are clear, distinct and individual points identical to the insert of real hair follicles. 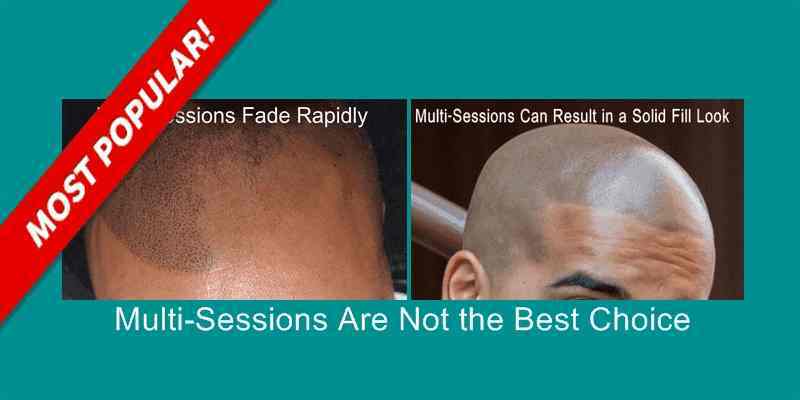 8 thoughts on "Scalp Micropigmentation Multi-Session Facts"
I can tell you that after recently receiving a single treatment from Mark Weston that this is real! I went to a ‘major provider’ previously and although I was initially happy, the results faded fast. I realize that this too will cure lighter, but the difference is substantial. Mark did a great job understanding my needs and working with me to change the game plan to suit me. Great experience! I had my scalp micropigmentation done about a month ago. I wanted to wait 30 days for the ink to cure before I wrote my review just in case there were any hiccups. Needless to say there weren’t. Amazing experience, Mark is a great guy and I couldn’t be happier. The procedure was relatively quick and inexpensive and I know in my hear of hearts I would have my regrets had I gone anywhere else!! Please at least consider him before going anywhere else. I only train those whom are are approved to open an authorized Weston Cwenter or their employee/artists. I am 64 years of age and have been losing my hair for years and I went to see Dave and Sonja Banks at the Cleveland Weston Center and I am totally happy with the results, it has restored 10 years to my looks, my son also had his scalp done and is very pleased also. Thank you, Michael for your comment. We are very meticulous about the people we approve to operate Weston Centers. Feedback like yours helps to give confidence to others whom may be considering new Weston Center locations throughout the country. We are happy that you chose the patented Weston System, one-session application over other companys’ multi-session methods. I’d like to get right to the point of the matter; Mark Weston is the “real deal” and I would highly recommend him if your considering the procedure. Several months ago I started researching SMP and spoke directly to many of the most popular companies. All promised results and prices which on the surface are initially similar. The method of actually doing the procedure however, is totally different then Mark’s. What inspired me to go with M. Weston was the single day “once and done” method which I’m extremely pleased with. All the other companies I was dealing with promised results, but their process included multi sessions, averaging around 3 to 4. This translates to increased time and money. Personally going through this process, I can’t even fathom doing it more then once. Unless of course you have a lot of extra time and money. If not, don’t even consider multi sessions which make no sense to me. Mark will explain that in detail. Mark’s experience as an artist is evident. He’s truly detailed oriented and is a professional by all accounts. He took his time and actually cares about the results, which is complete customer satisfaction. It was clear to me that Mark understands hair loss and is able to replicate follicles to achieve natural looking hair. He’s also a very amicable person along with his wife Gayle. They put you at ease immediately and make you laugh a lot. I could go on but as I stated above Mark’s a honest and up front person and easy to work with. As a retired State Trooper and present active duty military, Ive been around and met a great many people. I also did research and conducted a fair amount of investigation. I can say without hesitation that Mark’s a good guy and his skills are without question. I now consider him a friend, but without prejudice highly recommend his work. As I continued my research for my hair loss, I happened to come across a procedure known as SMP or Scalp Micro Pigmentation. The more I learned the more I realized this was the type of solution I’d been looking for. However, I discovered there were many companies to choose from, all of which boasted of being the originators of the procedure and the best.This is where the journey really began to unfold. I soon found myself on the phone for weeks at a time talking to just about every single SMP company representative about their method, watching hours and hours of YouTube videos, and reading article after article. I finally made a consultation with HIS Hair Clinic in San Francisco, CA. During the consultation interview I decided they would perform my SMP procedure. During the two hour trip back home I began to question whether or not I’d made the right decision, not to have the treatment done, but if in fact I’d chosen the right company to perform it. In order to be absolutely sure I did a few more hours of research on the Internet. This is when I stumbled upon Mark Weston. At first I thought to myself, “Another person and another company claiming to be the best, etc…” However, I’ve always had critical thinking skills, and being in the medical field it did not take me long to figure out what made this man and his treatment method far more superior than anything else I’d come across. Now, it is extremely important to note that every SMP company stated there would be a multi season treatment plan. Mark’s website insisted only one treatment was necessary – that’s a no brainer!